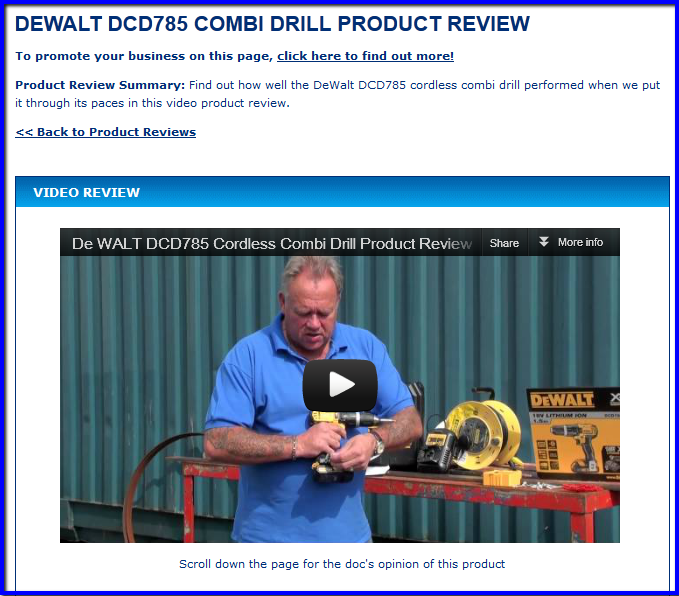 We have recently been asked by tool company Screwfix to compile some independent video reviews of their products. These are underway and are being updated onto our site weekly. DIY Doctor likes video tool reviews because they are a very easy way for us to communicate the pros and cons of each tool for the users of our site. So our customers win. Product manufacturers like their tools to be reviewed so that their products get exposure to the market, and are more likely to be found by DIY enthusiasts. So our commercial colleagues win. Our CEO Mike Edwards fancies himself as a bit of a star of the stage, and he certainly has the knowledge to be able to properly test the tools having spent more than 20 years in the building industry before setting up DIY Doctor. So he wins. If you like the very positive vibe of this blog post and you are a DIY and Home Improvement enthusiast then please do recommend tools that you want to see reviewed either by commenting here or visit our Forum and make a request under the relevant thread. If you are a tool manufacturer and would like to have your product reviewed then please contact us for more information. We wont hold our punches, but if you are as sure of your product as we are of ours I am sure you wont mind the scrutiny.